As you can see in the list, the calendar didn't only contain beauty products but also some accessories and stationary. While last year's calendar only contained 3 accessories, we now got 6 which is a bit sad as obviously they aren't worth as much as the Benefit products and they gave me the feeling that Benefit didn't really know what to put inside their calendars anymore. The notepads are quite cute but a bit too small to actually use and from the hair products I'll most probably only use the bow hair tie. Going over to the actual cosmetics, this year's calendar only contained 6 new products (compared to last year's calendar). I was aware of the fact that they can't change the whole range every single year but regarding the large product range of Benefit they could have come up with a bit more variation. Nevertheless the "new" products are quite cool so I won't be complaining too much. First of all we got two Ultra Plus Lip Glosses of which I really like the darker shade "Fauxmance". 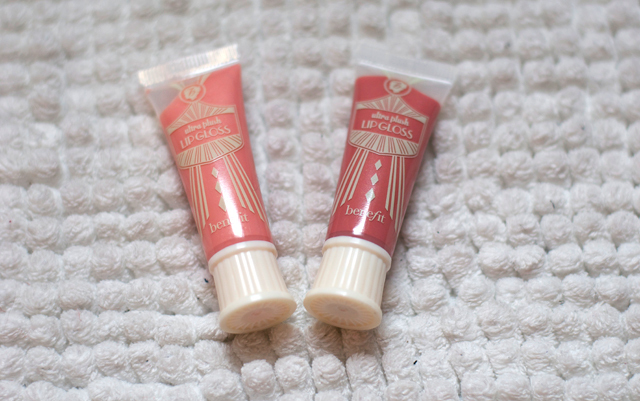 I think I already mentioned in last year's review that I'm not into lip gloss that much but the texture of the Benefit ones is really pleasant and not too sticky. The next product I got is the overly hyped "They're Real!" mascara. 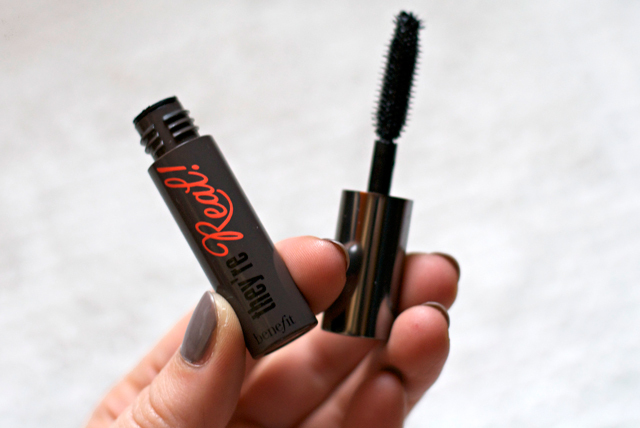 Compared to the "BADgal Lash" mascara it has a better brush: Not quite as big and with a special rounded tip for the outer lashes. Besides from that the mascara couldn't convince me yet. In order to get the fake lash effect you need to apply several layers which ends up in fly leg lashes. Furthermore I found the mascara to stay on quite badly and I had to remove several smears under my eyes throughout the day. The three most interesting products from this year's calendar were certainly the sticks Fakeup, Stay Flawless and Watt's Up! The Fakeup is a two in one moisturiser and concealer and the texture feels really pleasant to apply under sensitive eyes. Unfortunately the medium shade is a bit too yellowish and dark for my skin tone. The Stay Flawless is a stick primer which on the one hand is pretty cool as it melts on your skin but on the other hand it's quite sticky and hard to dispense properly. Also don't ask me if it works because I'm really bad at judging primers... And finally the Watt's Up! which is a highlighter stick and certainly one of the products I'm gonna use most as it has a bronze shade and thus looks really natural. 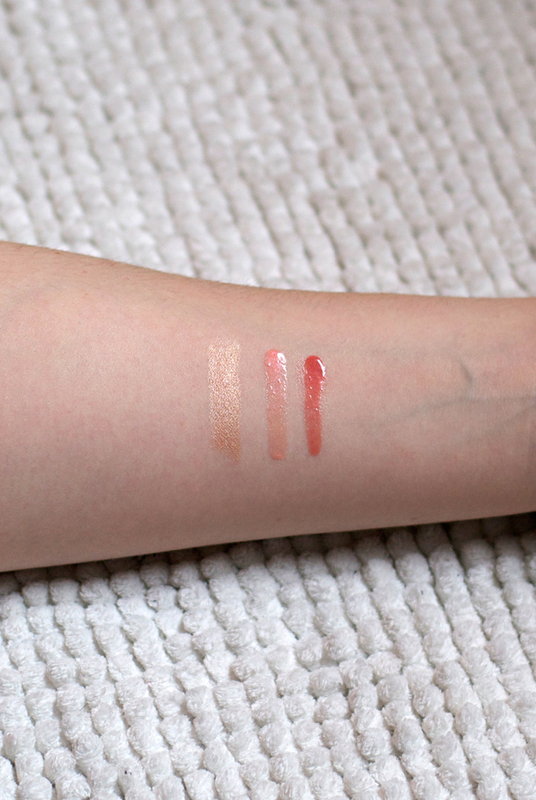 Below you can see it swatched next to the lip glosses. It would make a good creamy eye shadow, don't you think? For a review of all the other products simply check out the post about last years Benefit Advent calendar. 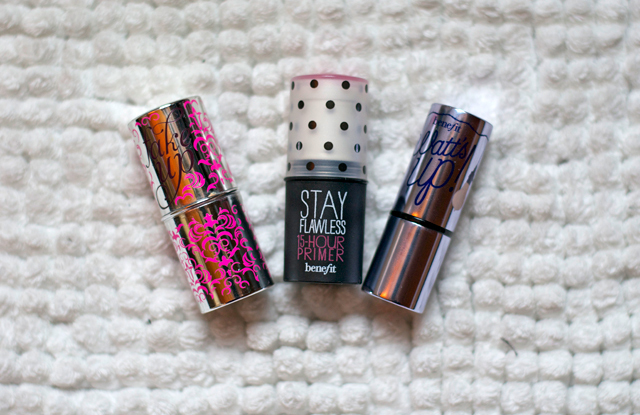 There you can also discover some more Benefit products like blushes, eyeliner or bronzer. 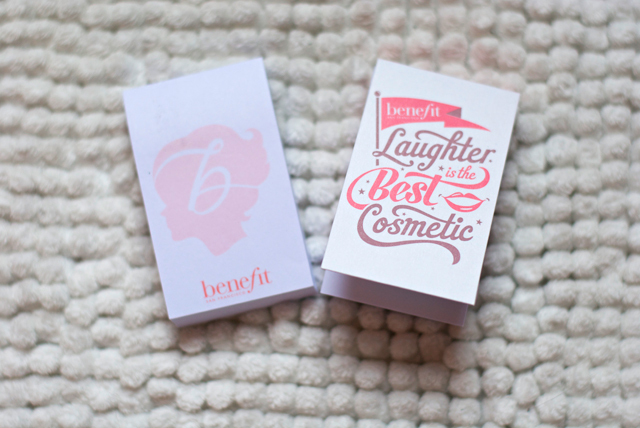 Did you already have a Benefit Advent calendar? If yes which year's content did you prefer? If no which Advent calendar did you have this year? I'm soooo jealous! Benefit's advent calender doesn't always release here each year and when it does it sells out so quickly I've never had the chance to get one yet! I totally would love to get it this year end if it releases again! Thanks for the mini reviews!